Toronto has more cranes in the air right now than any other city in North America. To some this is a sign of a booming economy; to others, a sign of a saturated condo market. 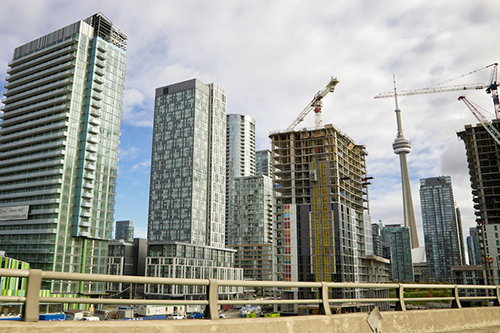 While condos do not typically appreciate at the same rate as freehold homes, they are still in demand – particularly to people wishing to lease. I have been working with one set of clients this summer who were set on a particular building in central Toronto, and they found themselves competing for each unit that came on the market. Their first offer was turned down, then the second, the third…all the way up until lucky number eight. The units are brand new; most belonging to foreign investors looking for tenants to pay the mortgage while the property increases in value. It’s still a smart strategy. Clients have expressed concern to me over the last five years that the housing market is overpriced; they are afraid of a housing bubble, or a market correction, or sharp increases in interest rates. Instead, interest rates sank to record lows (where they still remain), housing prices had healthy gains year over year, and those who chose to buy have seen excellent returns in their investment dollars.